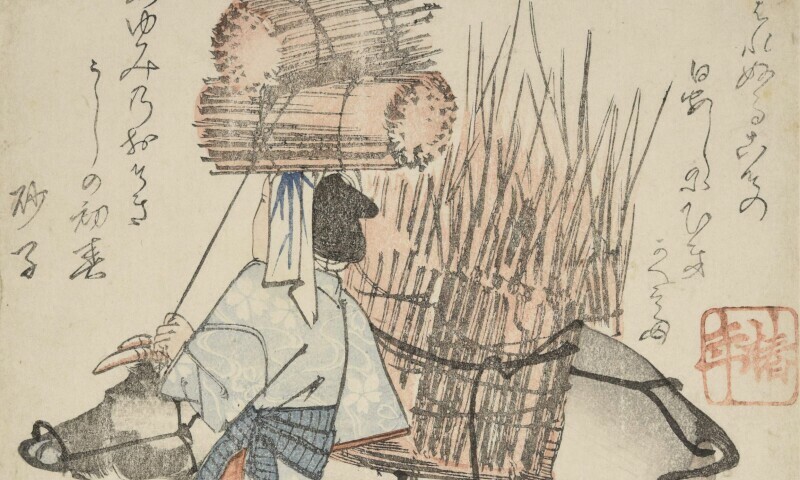 Surimono of the Edo-period, Chinnen Ônishi, Woman from Ohara near Kyôto with an ox and a brushwood bundle on her head. Around 1829. The presented Shijo-Surimono from the Gisela Müller and Erich Gross Donation – luxuriously crafted woodblock prints – bring together haiku poems by famous Japanese poets with lyrical and humorous illustrations by artists of the naturalist-decorative Shijo painting tradition. Produced for exclusive literary circles, Shijo-Surimono impress with their imaginative motifs and rich colour palettes.